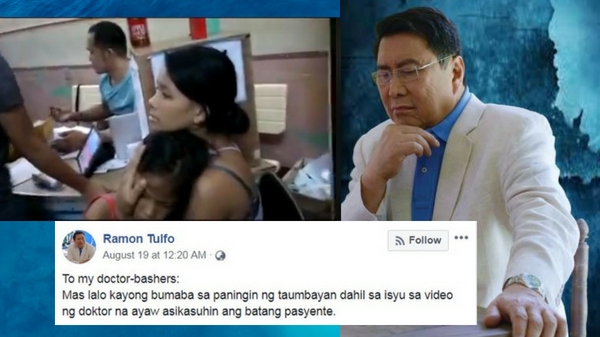 MANILA, Philippines – Columnist and broadcaster Ramon “Mon” Tulfo decided to hit back on his “doctor-bashers” saying that the public has lost respect for them over his viral video. Ramon Tulfo says he apologizes to the patients of PGH but not to the doctor. Recently, Tulfo’s driver accidentally hit a young girl in Navotas. Tulfo and his driver brought the girl to PGH. While inside the emergency room, Tulfo insisted in filming the treatment of the victim. The doctor on duty explained that no videos are allowed in the area. When Tulfo still insisted, the doctor refused to treat the girl. Emotions flared as the radio broadcaster got angry. In a statement, PGH stated, “The PGH PA condemns the contemptible acts of Mr. Ramon Tulfo as his team videotaped the events at the ER triage while he was verbally abusing the staff members on duty as a minor he brought to the ER was being assessed." The PGH group also called out Tulfo for naming the triage officer’s name without consent. “Cyberbullying and doctor shaming are not only punishable by Philippine law, these also demean the healthcare workers’ and patients’ rights to privacy. We stand firm with the PGH community in upholding the rights of our staff, students, and especially the patients whom we serve," the group added. Meanwhile, the All UP Academic Employees Union-Manila also took PGH’s side and called Tulfo’s action as “grossly irresponsible.” The Union asked the PGH personnel to take legal action on the incident.